Tween Tuesday is a weekly meme I host to highlight great reads for tweens! Join in the fun and add your own Tween Tuesday post in the Mister Linky below. About the Book: Meggy Swann arrives in London lost and confused. Her father summoned her, yet wants nothing to do with her. She walks with the help of walking sticks and often feels like an outsider. Yet in London, Meggy finds a new life-she begins to make friends and learn new skills and her outlook begins to change. Things just might look up for Meggy Swann! GreenBeanTeenQueen Says: In full disclosure, I grew up loving Ms. Cushman's Catherine Called Birdy. It's one of my favorite books from my childhood. So I'll admit I may have been pre-disposed to like this book. I really feel that Alchemy and Meggy Swann is Ms. Cushman at her best. All the reasons I love her books are here. The historical detail she puts into her writing is superb. I really think Meggy would be a great introduction to the time period. 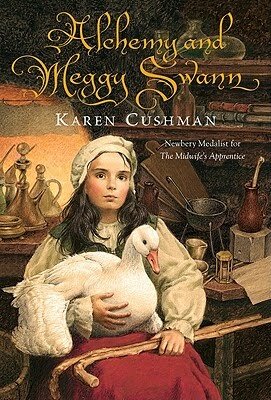 (Meggy takes place in 1573) It's fascinating to read about Meggy's daily life and how people lived during this time. I really loved Meggy. She was somewhat annoying at the start, but she grew on me. She is such a strong girl and I loved her comebacks-she's very funny. I don't want to give away too much, but I really liked the fact that Meggy could have been negative about everything-I wouldn't really blame her for it either. Her growth throughout is what made the book for me. I think she might rival Catherine for my favorite Cushman character! The book has an overarching storyline, but it also has the feel of smaller vignettes in Meggy's life. It all comes together in the end and it's a treat to see how Ms. Cushman pulls it all together. The book is somewhat heavy in historical detail and language, so it might not be an easy read for some younger tweens. But if you have historical fiction fans or readers looking to "read up," give them Alchemy and Meggy Swann. This is one treat of a book you won't want to miss. Full Disclosure: Reviewed from ARC sent by publisher. I love Ms. Cushman as well. I will have to look into this one! I might have bent the Tween Tuesday rules with my post...it's not released yet. But I know it will be awesome! Sounds like a fun read - thanks for posting this! You might also like a historical fiction book called, "Power of a Woman." It's a fascinating medieval story told through Eleanor of Aquitaine. It was so interesting I couldn't put it down. Great stuff! I read this one through NetGalley. I agree it's a bit too heavy for younger kids but it's a fascinating story.. I brought this book home yesterday after reading your review! Nise-I hope you like it! I just finished listening to the audiobook, and loved it. The amazing Katherine Kellgren narrates, with spice and zest to match Meggy's spirit! Well worth seeking out.